You may think that only seniors suffer from hearing loss, and you won’t have to think about your hearing for years to come. The truth is, adults are more at risk of hearing loss than ever before, due to crowded city streets, packed music venues, and dangerously loud workplaces, and around half of those with hearing loss are adults between 18 and 65. One of the leading causes of hearing loss is workplace noise. You’re used to the noise levels at work and might not realize just how much of an impact this noise is having on your overall hearing health. It’s estimated that each year over 22 million Americans work in dangerously loud environments, and another 30 million workers come into contact with ototoxic chemicals, or chemicals that are damaging to the ears and harmful to hearing health. Every year, around $242 million is spent on workers compensation for disabilities related to hearing loss! Since noise induced hearing loss, and workplace hazards are preventable, this figure is astounding. Living with untreated hearing loss will affect your job performance and can jeopardize your safety and even your career. If you can’t communicate with coworkers or didn’t understand the directions you received from your boss, you could be putting everyone at risk. Hearing loss also affects your salary, and studies have shown that those with hearing loss are often overlooked for promotions, receive lower wages, and face discrimination at work. In an analysis of data, Sergei Kochkin from the Better Hearing Institute discovered that those with hearing loss made around $31,000 less per year than their hearing peers! When it comes to noise levels in the workplace, how loud is too loud? The National Institute for Occupational Safety and Health (NIOSH) recommends that noise exposure doesn’t exceed 8 hours of work in noise levels of 85 decibels. This is roughly equivalent to the sound of heavy city traffic. Noises that far exceed this limit are heavy machinery, sirens, fireworks, a rock concert, or firearms. The louder the noise, the sooner you’ll sustain permanent hearing loss. Even being exposed to these loud noises for a few minutes or an hour can lead to temporary hearing loss, humming in your ears when you leave work, or tinnitus. If you’re in a loud area for any amount of time, you need to protect your hearing. A good rule of thumb is that if you have to shout to be heard by your colleagues, it’s too loud, and you need to protect your hearing. The NOISH recommends reducing the noise levels in the workplace and requires employers to take steps to protect employees’ hearing. The first line of defense is engineering controls, such as substituting loud equipment for quieter machinery, modifying or replacing old machinery, and building sound barriers. Next, administrative controls can protect hearing by reducing workers exposure to noise, limiting the amount of time spent with noisy machinery, increasing the distance between workers and the machinery, creating schedules to minimize noise exposure, and providing quiet places for lunch breaks to give your ears a chance to rest. Employers must also provide earplugs for everyone working in noisy environments. 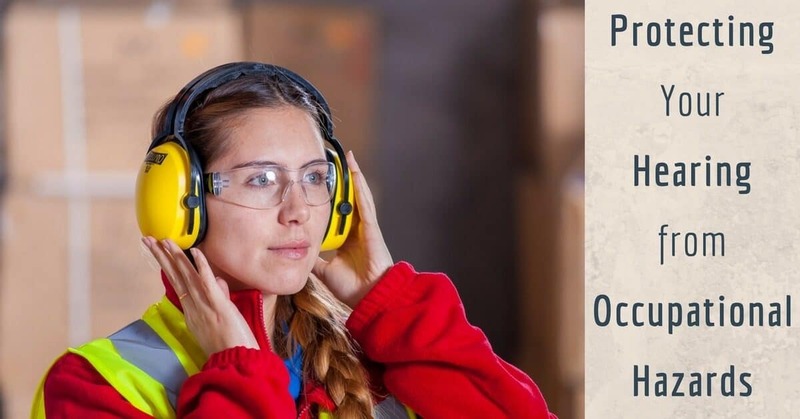 Ultimately, it’s your responsibility to do everything you can to safeguard your hearing by wearing personal protective equipment such as earplugs or earmuffs to protect yourself from occupational hazards to your hearing health. If you have hearing loss, whether from noise induced hearing loss, workplace noise, or some other cause, the best thing you can do for your hearing health is treat your hearing loss right away. Living with hearing loss can lead to a host of negative consequences, such as difficulty communicating, problems in your relationships, social isolation, safety concerns, work stress, and worse overall health. At My Hearing Centers we have a host of hearing devices to choose from that are designed to fit your unique hearing needs. Want a discreet device that has all the power you need to get through your busy day? We have in-the-canal and invisible-in-the-canal devices that will have you hearing in no time, both at work and at home. Come see us today and see what a hearing aid can do for you.